I'm adding length to the sleeves so I'll probably finish the sleeves first so I can knit them flat before joining to do the body in the round. 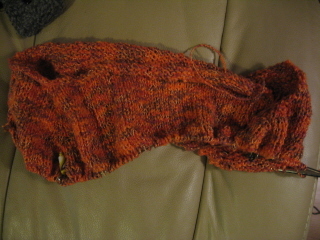 I need to find more "old" yarn to use...since I have even:::cough::: more :::cough:::: yarn :::cough::: on the way. 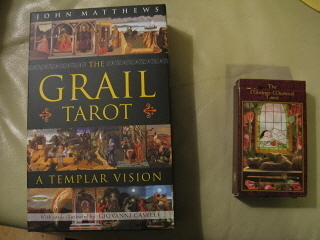 And so far, historian that I am, I love the new Grail Tarot. John Matthews is well versed in Grail lore (I also have his Hallowquest Tarot, written with Caitlin Matthews...and Caitlin's Merlin Tarot.) What can I say, I'm a sucker for this stuff. ;) This more of a Christian deck than Pagan and it's really fascinating to see how he assigns different events to the cards. The Modern Medieval Tarot looks promising, although I haven't had time to really go through it yet. It's by the same folks who did The Vision Tarot so the card images are a collage of old & new photographic images. I used to be an avid collector of Tarot decks. At one time I had around 60 (small potatoes by collector standards) and then sold 25 or so on eBay. Now there are so many new & interesting decks out there I'm finding myself drawn back in. I do have one rule - only collect those decks I would/could read with. That tends to narrow the field a bit & control any thoughts of over-spending!